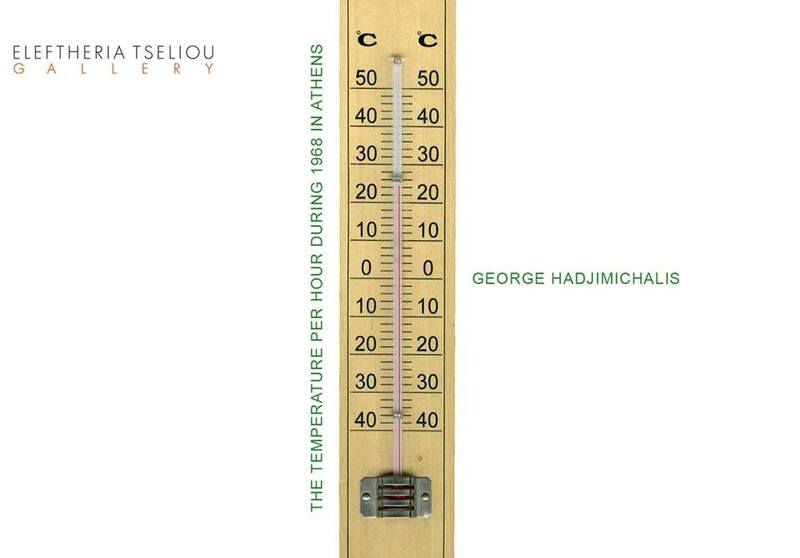 Eleftheria Tseliou Gallery is happy to present George Hadjimichalis’ solo exhibition entitled ‘The temperature per hour during 1968 in Athens’. The show opens on Thursday, October 11, and will be on display until November 24, 2018. Wanting to create a work on the temperatures in the year 1968, George Hadjimichalis searched for the corresponding records, which, as luck would have it, were eventually found at the Meteorology Lab of the Athens Agricultural University. This work is, in a sense, the continuation of a previous piece entitled Days and Nights in York (1998), which was shown in the 2001 exhibition ‘George Hadjimichalis, Works 1985-2000’ at the National Museum of Contemporary Art, and in 2002 in his solo exhibition ‘George Hadjimichalis, Seven Works’ in New York’s MoMA / PS1. George Hadjimichalis, one of the most important contemporary artists of his generation, often bases his work on records he keeps in his studio, as well as on records sourced elsewhere. This work, like the one on York, is a version of landscape painting, in the sense that it comprises a part of nature into an image through painting, since painting shows us those things that we cannot see. The exhibition will present four paintings and a video.